A resourceful Real Madrid rolled to a 76-89 road win over Union Olimpija Ljubljana on Thursday to claim exclusive possession of first place in Group A. The victory pushed Madrid's record to 4-1, while Olimpija dropped to 1-4 with its fourth consecutive defeat. After a 0-9 start to the game, Olimpija scored the next 10 points to lead briefly, but Madrid reestablished control going into halftime and never let the hosts closer than 6 points the rest of the way. Rudy Fernandez paced five Madrid double-digit scorers with 18 points. Felipe Reyes followed with 16 and 7 rebounds off the bench, while Jaycee Carroll scored 14, Nikola Mirotic 13 and Marcus Slaughter 11. 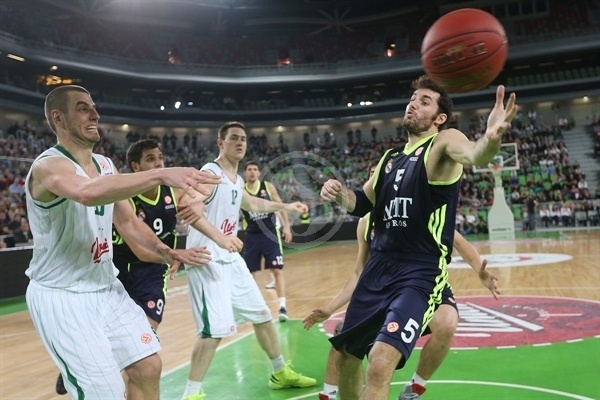 Madrid made 68% of its two-point shots (31 for 45) and dished 19 assists to just 9 for Olimpija. The hosts got 22 points from Dylan Page, 14 from Jaka Blazic and another double-double, 11 points and 10 rebounds, from Aron Bynes, who also blocked 4 shots. Fernandez smoothly drained a three-pointer, Carroll dropped a reverse and Mirotic finished a fastbreak as Madrid made it look easy in the first minute. By the time Carroll blew to the basket for another layup, Madrid led 0-9 and Olimpija boss Saso Filipovski needed a timeout. The hosts got on the scoreboard with a put-back by Baynes and a fastbreak by Blazic. 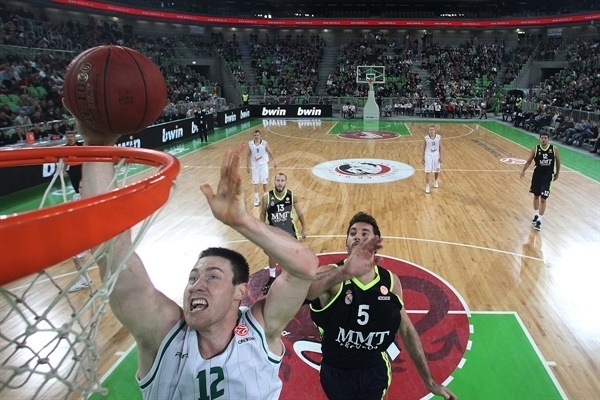 The tireless Baynes kept working in the paint until Olimpija had eclipsed Madrid's start and taken a 10-9 lead. After several scoreless minutes, Mirotic made a finger roll, Sergio Llull flipped an alley-oop dunk pass to Slaughter and Carroll sped for a fastbreak layup for a new Madrid lead of 10-15. Fernandez made an alley-oop tip-in at 12-17, but got called for a technical foul for arguing, which let Page score 2 free throws and a triple on the same possession to tie 17-17. Madrid played a perfect final possession for an open three-pointer that Carroll knocked down to keep his team up 18-21 after 10 minutes. 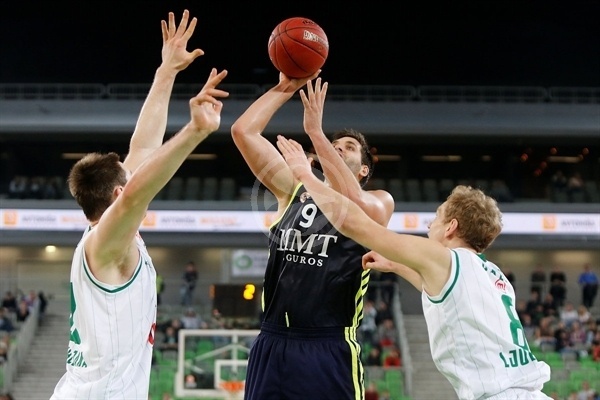 Page and Dino Muric of Olimpija traded baskets with Carlos Suarez and Llull to open the second quarter before Rannikko's pull-up three-pointer forged another tie, 25-25. Felipe Reyes scored in a crowd to keep Madrid in front and then made a three-point play the hard way to make it 25-30. 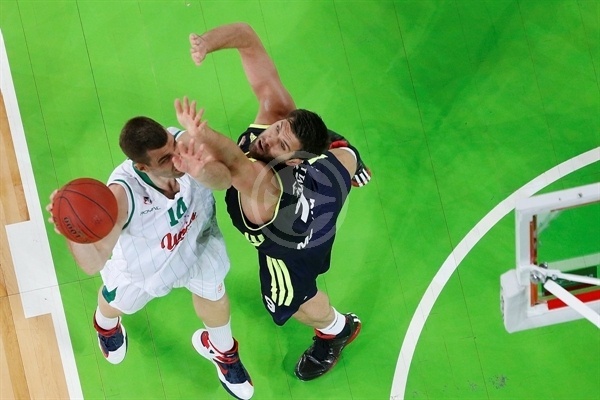 Drazen Bubnic and Muric kept Olimpija close at 29-32 before Suarez put back an offensive rebound for Madrid. Alen Omic helped Olimpija's cause with a layup, but it was answered from downtown by Sergio Rodriguez. When Reyes downed a free throw, Mirotic converted a nice pass from Rodriguez and Martynas Pocius shredded Olimpija's defense for a layup, Madrid suddenly had its biggest lead, 31-42. After a timeout, Pocius scored again inside as Madrid continued pouring it on with Rodriguez feeding Mirotic to finish a 0-10 run. It took two quick baskets for Page and Blazic for Olimpija to draw within 35-46 at halftime. Mirotic boosted Madrid's difference to a high of 13 points, 35-45, immediately out of the locker room. Olimpija resumed its resistance, however, with a triple from Sasu Salin followed by free throws from Baynes and a new jumper from page that were good enough for a 43-50 scoreboard. The teams traded 3 free throws each and two-point baskets by Slaughter and Page as Madrid's lead held at 7 points, 48-55, midway through the quarter. Whatever Olimpija tried, like another triple from Page, Madrid matched or bettered, with Fernandez responding with the same and Reyes adding his next basket to return the lead to double digits, 53-64. Page and Blazic split 4 more free throws, but Madrid finished the third quarter with another basket by Carroll to lead 57-68. A Reyes jumper stretched the lead to 13 points to start the final quarter, but Klemen Prepelic with back-to-back shots downtown showed the hosts weren't quitting. Despite a triple by Fernandez, a basket by Teemu Rannikko and a blast from the arc by Blazic had Olimpija within 68-75. Salin's second three-pointer, from the corner, cut the difference again, to 71-77, but Slaughter took all those points back the with a basket-plus-free throw for Madrid. Baynes drop-stepped for a reverse, however, drawing Slaughter's fifth foul, but when he missed the free throw, Reyes responded with a jumper to make it 73-82. Salin was let alone in the corner for another triple. After a timeout, however, Fernandez stole and finished a break to restore a 76-84 advantage. When Rodriguez stopped and popped the next shot, the visitors were up doubled-digits again, there were under 2 minutes left and the victory was on its way back to Madrid. 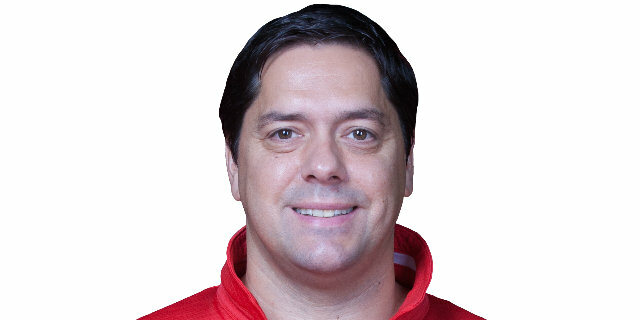 "We showed another solid performance in the Euroleague. Despite a bad beginning of the game, when Real Madrid took a big lead, we played as we planned and with a fighting approach. We were defeated by their experience and quality at the end. We had a chance to surprise them, but we missed couple of open shots in the clutch moments. Real Madrid is a very unpredictable team with great offensive potential and you simply do not know how they will attack you in some moments. I would like to thank the fans who came out today to support us." "Congratulations to my team for the victory. We expected such a game. It was hard from the beginning. We had a good start and a quick lead, but then the home team showed a lot of heart. They came back in the clutch moments. Our bench really made a difference today. We had good control of the rhythm in the second half, but we knew that Union Olimpija is a team with young and talented players, and that they would fight until the end. This was a very important win for us."